Subject to correction, the product was first added on 2019-01-14 16:28:59 and the last date we have for this product is 2019-01-14 16:28:59, where the last unit was sold for R 5470, which may have been a final clearance price. Canon CA-A10 Compact Power Adapter for EOS C300 Mark II Camcorder Copyright © 2019 ComXpert International CC - COPYING IS ONLY ALLOWED FOR THE PURPOSE OF SENDING US ENQUIRIES. E&OE. The Canon CA-A10 Compact Power Adapter for EOS C300 Mark II Camcorder converts AC power to DC power allowing you to power your Canon EOS C300 Mark II camera. The adapter incorporates an output protection circuit and a 1A, 250V fuse for input voltage protection. The adapter's camera power cable is not detachable and features a custom 4-pin LEMO connector. The AC power cord is detachable and feature a polarized two prong plug. Box Dimensions (LxWxH) 8.8 x 6.4 x 2.3"
The best price and guaranteed service and backup from official computer suppliers in South Africa for the 0871C003AA Canon CA-A10 Compact Power Adapter for EOS C300 Mark II Camcorder. Find related 0871C003AA Canon CA-A10 Compact Power Adapter for EOS C300 Mark II Camcorder products in our Digital camera accessories Category for even more options. 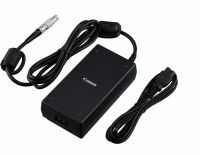 Read reviews and find out about 0871C003AA Canon CA-A10 Compact Power Adapter for EOS C300 Mark II Camcorder. Discounts, specials and cheap prices only at ComX Computers.